What are you missing in your research in the United States census records? Have you really analyzed all of the information? Do you know why the census was taken and how? In conjunction with our Research Like a Pro series, I’ll be sharing several posts on basic record types. The more we learn about the records that we use for finding and documenting our ancestors, the better genealogists we’ll be. What are U.S Census Records? The United States government began taking a census of it’s citizens in 1790 to determine how many representatives a state was allowed in the House of Representatives and how much tax was owed by each state to the federal government.¹ Every ten years census takers spread out over the country, visiting each household and recording important information on a census form. That census record is a look at the family at that moment in time. As the government wanted to know more information about it’s citizens, questions were added to the census form. Those questions changed from year to year depending on what was happening in the country. Although the last census to be taken was 2010, only the 1940 and previous censuses are available to search because of privacy issues. A census is released 72 years after it is taken. Most of the 1890 census was destroyed in an unfortunate fire and just a few fragments remain. Where Can You Access Census Records? 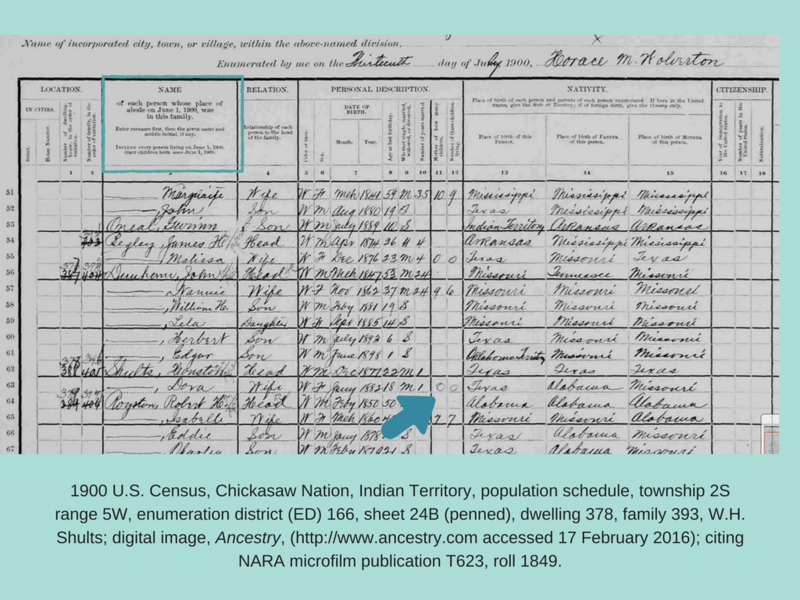 The United States census records have been digitized and are available on FamilySearch and its partner websites: Ancestry, My Heritage, and Find My Past. If you can’t find your ancestor on one website, try another as each search engine is different. Always look at the image to discover all of the information that is not indexed and to see if you agree with the indexers listing of your family’s names. Often you can decipher a name more accurately because you know your family. 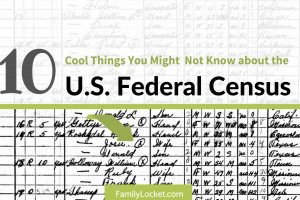 What Can You Find on each U.S. Census? 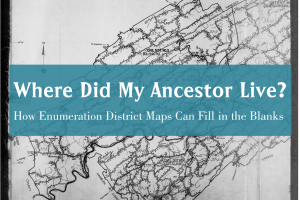 Because the United States government asked different questions for each census year, knowing what is located on each is very helpful in researching your ancestor. From 1850 on, each member of the household was listed with useful information for researching your family. The following table, available at the FamilySearch wiki, gives a summary of some of the most helpful information – Beginning Research in United States Census – Records Table.² The table shows what information was added and dropped each year, as well as the date of the census. When Was Each Census Taken? An often overlooked aspect of the census is noting the date that the count was to take place. My great grandparents, Houston and Dora Shults are listed on the 1900 census, pictured below. On Dora’s line, it is noted that she is the mother of 0 children. In actuality, her firstborn son had been born on 2 July 1900, eleven days before the census taker visited their home in the Chickasaw Nation, Indian Territory. Why is Robert Cisnie Shults not listed with his parents in the household? The answer can be found in the instructions for the 1900 census at the top of the NAME column: “each person whose place of abode on June 1, 1900 was in this family. . . Include every person living on June 1, 1900. Omit children born since June 1, 1900.” Since Robert Cisnie Shults was born after June 1, 1900, he was not listed in the household. Understanding the dating process can help you to better analyze your ancestor’s household and the family members included. In the case of the 1900 census shown above, notice that the date the households were listed was the 13th day of July, 1900. The printed form has “June” for the date, because the census was to have been completed within thirty days, but this census taker was a little late. 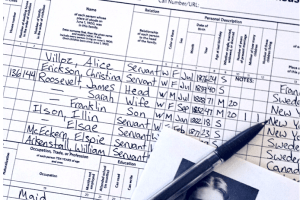 Some tricks and tips can help you be successful in your search in the census records. Few people were missed so often it is a finding problem if your ancestor is nowhere in the census. Maybe his name was misspelled or indexed incorrectly. Perhaps your family migrated west or moved back east and are not where you would expect them to be living. Here are some ideas to help you locate your elusive ancestor. -Use wildcards to pick up name variants. An asterisk (*) matches zero or more characters. A question mark (?) matches one character. The only restrictions are that a) either the first or last character must be a non-wildcard character and b) names must contain at least three non-wildcard characters. -Try no-name searches or use no surname and narrow by other fields like residence, birthplace, and age. -Search for an unusual given name in the family. -Use multiple census web sites – different indexers and different search engines. -When all else fails browse the actual pages. Look through all the images for the area you think your ancestor must have been living. -When trying to interpret handwriting look for the same letter somewhere else on the page. -Try choosing one of your ancestors and locate every census that he would be listed in for his lifetime. Compile all of the information and see if you can discover something new about him. -Watch for the follow-up post on the United States census where I’ll give you ideas for how to analyze and use the census information that you’ve located, share some of my favorite links for census research, and demystify the non-population schedules. Best of luck in finding your family in the census records! Do you want to take your genealogy research to the next level? In our Research Like a Pro Study Group, you’ll complete assignments and peer reviews and receive feedback from professional genealogist, Diana Elder AG®. ¹ Carroll D. Wright, The History and Growth of the United States Census, (Washington: Government Printing Office, 1900), 13. ² “Beginning Research in United States Census,” Records Table, FamilySearch Wiki (https://familysearch.org/wiki/en/Beginning_Research_in_United_States_Census_Records#What_are_the_United_States_census_records.3F : accessed 30 May 2017). ³ “Instructions to Enumerators,” Department of the Interior, Washington,1900; digitized booklet, United States Census Bureau, (https://www.census.gov : accessed 3 May 2016). Enjoyed the write up. Loved the table that explained what was asked during each census. I think this will come in very handy. Thanks, Pete. I’m glad you’ll find the table useful. The census has such a wealth of information for us to mine! I enjoy listening to your podcasts when traveling. I love the fact that every minute is informative and time is not wasted on idle chit chat and advertising. I can hardly wait to get home and go to my computer to download any cheat sheets and research using your suggestions. I have been doing family research for over 25 years and thought I had paid good attention to detail on the censuses but I always learn something new or forgotten from your blog or podcast. Thanks for this great comment! I’m glad you’re enjoying the podcasts. I agree that just when we think we know a record type thoroughly we discover something new. I think that is why I love the research – its such an adventure.